Have you heard of the story of the gingerbread man? Well, the gingerbread man did not want to get eaten so he decided to run and run and run. Solve all all the locks to try and find him. 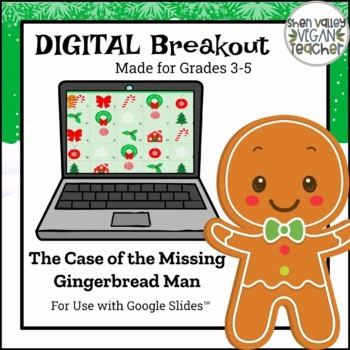 This is a great Digital Breakout for first time users! 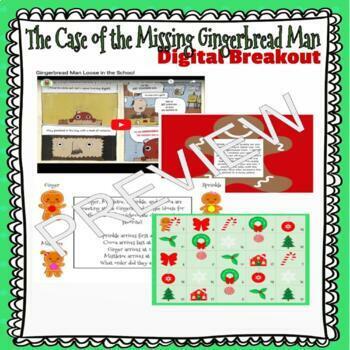 This digital activity can be completed independently, with partners or small groups. Students will have the opportunity to think critically, collaborate, communicate, and problem-solve throughout this 45 minute digital activity. You will be force to make a copy of all four locks. You will then insert each Google Form lock link into each slide. Instructions are provided. Students will click on the link, then type in their answers and click Submit, then they will click "View Accuracy" to see if they unlocked the lock, if not, they will need to click "Submit another response" to try again. Lock 1 - Students will watch a video and answer questions. Lock 2 - Students will complete a Google Form Scavenger Hunt using data validation. Lock 3 - Students will solve a math word problem. Lock 4 - Students will skip count by 2's. - All devices will need to have access the internet. If you find this resource helpful, please remember to leave a review, follow my shop, and check out my other listings at ShenValleyVeganTeacher. Thank you for shopping!